Stellar Four: Do Want! Doctor Who Lego Announced! Do Want! 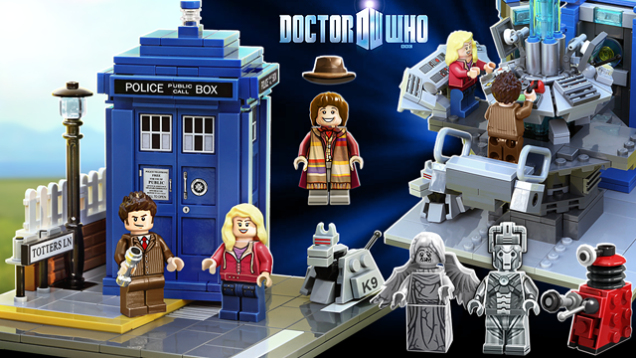 Doctor Who Lego Announced! Sorry to interrupt book week, but I couldn't contain my excitement! Lego has finally announced that they've given the green light to make DOCTOR WHO LEGO! I have never been more thrilled for anything in my entire life! To your left, you can see a mock up (but not a final image) of what this may look like. Imagine, a Lego TARDIS with a Lego Ten and Rose! A Lego Dalek! The set was created by a fan for the Lego Ideas (formally known as Lego CUUSO) platform. Lego Ideas is where fans can submit ideas for new Lego sets. Lego has greenlit sets about female scientists, the Delorean from Back to the Future and the Mars rover. People have been trying to get a Doctor Who set off the ground for years and now success has finally been achieved! While no release date has been given, most signs point to the set being out in the later part of 2015. Perhaps for the holiday season? Santa, listen, I promise to be SO GOOD this year.